Cats are always fun to play with. They have a lot of energy which is sometimes hard to channel. They tend to scratch at furniture or damage things accidentally.This is where cat trees come in handy. They are designed to keep your cats busy and away from furniture. 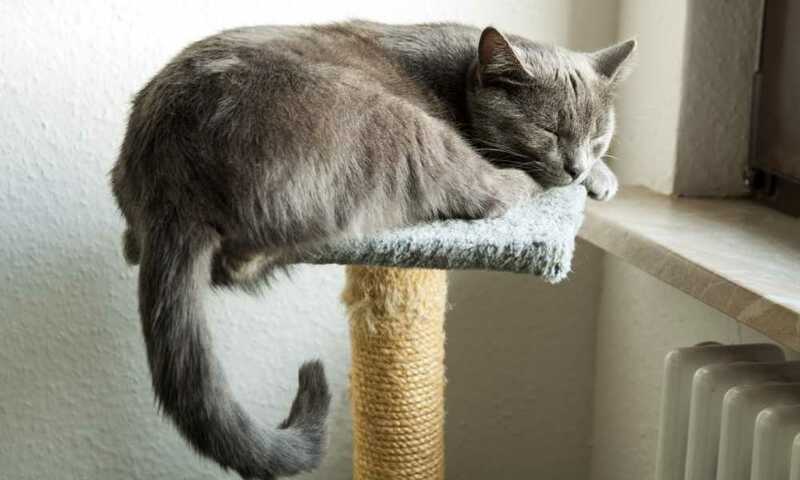 Also, cat trees provide your pets with comfortable places to rest once they finish playing.You’ve come to the right place if you have one or more large cats, who will need a cat tree that fits their stature to keep them occupied. 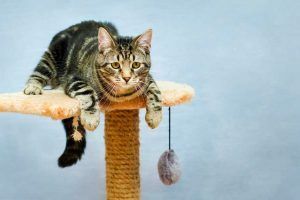 Take a look at the top characteristics of 5 such products and decide for yourself which of them is the best cat tree for large cats. Go Pet Club’s 72” Tall Cat Tree offers your cat several places to rest and play. It is quite comfortable due to its soft cover. This busy cat tree with lots of features will keep your cat away from the rest of the furniture. This product comes with 2 condos, 3 perches, and multiple scratching places. It is pretty large which makes it suitable for bigger cats. The tree is made from compressed wood covered with faux fur. This combination makes the product strong and comfortable at the same time. Finally, the scratching places are wrapped in sisal rope that will enable your cat to sharpen its claws easily.In addition, the tree is very easy to install. You will get all of the installation equipment in the package, along with detailed instructions.Keep in mind that this is one of the pricier models. One of the reasons for this is its high quality construction material and very soft covering fabric. Don’t worry – if you plan to spend less on a cat tree, we have other options for you coming up. 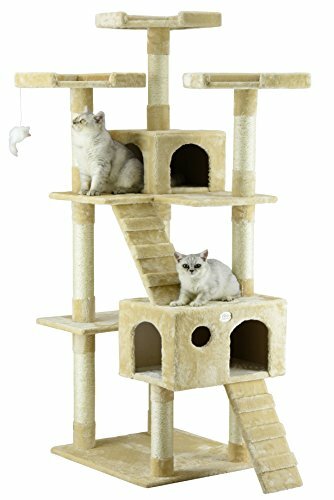 If you have enough space at your home and you are ready to invest more in a quality cat tree, this may be a good option. It will keep your cat occupied thanks to a variety of sleeping and playing places. This is a rather spacious playground for your cat with numerous interactive elements. It doesn’t require much space thanks to its corner design. If you have a larger cat, this model may be a good choice. The main benefit of the Furhaven Tiger Tough is its variety of interactive elements. It contains a supersized cat condo, which gives your cat privacy while resting. 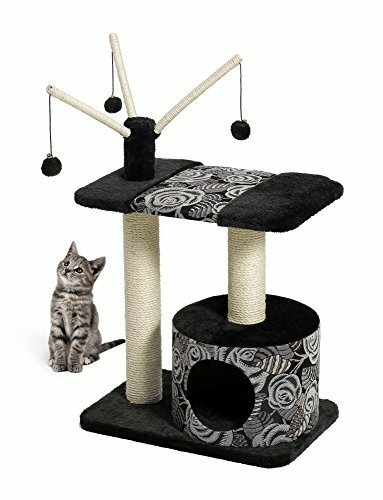 Additionally, the tree offers a hanging ball toy and a springy ball wand to keep your cat entertained.Another advantage of this cat tree is a spacious lounge platform on the very top. This way, your cat can rest and observe things from a high platform.The Tiger Tough cat tree is low-maintenance. You can clean it with a mild soap or detergent and let it air dry. The product is easy to assemble and all of the tools and instructions come in the package. 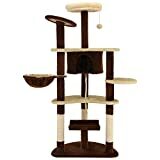 It comes in brown and cream colors that should fit nicely in most homes.Compared to other similar products, this cat tree is fairly inexpensive. It is good for those who want a good cat tree for large cats on a tight budget. General surface: The playground base, multilevel platforms, ladder, and condo house are lined with plush faux fur fabric, which is soft on noses and paws, providing optimum surface comfort for lounging and active felines. Natural instinct: the sisal-wrapped posts help relieve your cat's instinctual need to dig their claws into something and scratch away. The Sisal fiber is both durable and biodegradable, ensuring a long-lasting, economical use while being . Entertainment: featuring an extended sisal scratcher post, a ladder for active traversal, a hanging puff ball, along with an enthralling springy ball wand, your cat is provided endless stimulating entertainment and activities. Sleep surface: The cat playground features a suspended condo house. Incredibly spacious and lined with plush faux fur, The condo house provides warmth, coziness, and privacy for lounging or resting felines. This is a good product that offers a lot of entertainment possibilities. It may not be as tall as the alternatives, but it will still keep your cat occupied. Moreover, you won’t have to pay too much money for it, which is an additional benefit. This is a 4-level cat tree that provides your cat with enough comfortable resting places. Furthermore, it contains large stretches of sisal scratching posts. The MidWest Feline Nuvo Cat Tree combines a very strong frame with soft and comfortable cover. This gives your cat a chance to play and rest at any time. Each of the four levels features super-soft fabric cover that ensures additional comfort.The main idea behind this model is to provide cats with multiple elevated platforms. At 60” tall, it’s one of the higher models. The dark blue color doesn’t show fur and dirt as easily. It is also easy to get fur and dirt off of it. You can quickly install this cat tree if you follow the instructions provided in the package.This cat tree is less busy compared to most. There are open spaces around the platforms that invite high jumps.Considering all of its features, it is a good long-term investment. As a guarantee for the product’s quality, the manufacturer extends a one-year warranty with the purchase of this cat tree. The MidWest Feline Nuvo Cat Tree is a simple product that offers several comfortable resting places. But if you really want to keep your cat entertained, you may need to look at some alternatives. If you’re looking for a fun playground for your cats, you will enjoy this product. It has spacious resting places, one hammock, and multiple interactive elements. Additionally, this cat tree is very soft thanks to its high quality fabric cover. 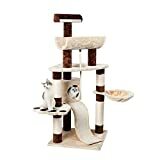 The Ollieroo Cat Tree Tower contains three scratching posts, a condo, hammock, scratching plate, bottom plate, and perch. All of these elements will keep your cat busy and away from your furniture.This product is suitable for large cats but not overly so, as it is only designed to support up to 20 pounds of weight. One advantage of the product is that all of the resting spots are covered in plush fabric. On the other hand, the scratching posts are quite strong and resistant, which helps your cat sharpen their claws quickly.Have in mind that this is one of the bigger models. It is probably not the best solution for smaller rooms. It comes in beige and a beige-brown combination which can fit most decors. This is a great product for keeping your cats occupied and off the furniture. Additionally, it will provide them with resting comfort. If you have enough space at home, this may be a good choice. Here is another quality product for large cats. It includes numerous entertainment and resting spaces. 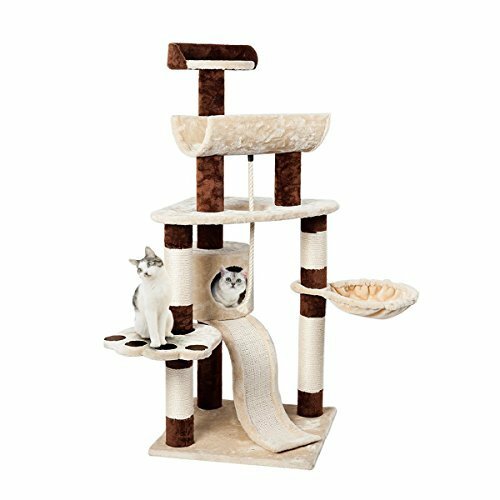 The Favorite Cat Activity Tree comes with cylinder, semi-cylinder, a hammock, and paw pad, as well as triangle and round pads. These elements are too inviting for cats to not want to explore and play. 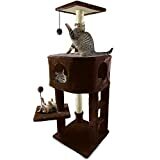 They will also have access to highly resistant scratching spots for sharpening their claws.Since it is one of the taller models, it can be placed next to a window to afford your cats the opportunity to look outside.This cat tree for large cats is easy to put together, and all of the screws are included in the package, along with a manual. Its construction is quite solid, and the resting spots are covered in plush fabric. Also, cats will enjoy scratching the strong sisal surfaces.When it comes to the price, this model is middle-of-the-road. If you take into account its diversity of elements, it may be a worthy investment. Although all of these models have numerous advantages, the title of the best cat tree for large cats goes to the Furhaven Tiger Tough Cat Tree. It successfully combines both resting and entertainment elements, which are important for your cats. Moreover, it is very easy to maintain, which will save you some time.This model is fairly inexpensive and easy to install. It can support cats of all sizes, though it’s particularly great for large cats. As soon as your cats get a chance to test their claws on the strong sisal rope spots, they won’t want to scratch anything else. This furniture-saver is a great choice for those who want a high quality cat tree for large cats without having to spend a lot of money.